You have my permission to translate this mod and upload it to the Nexus or non-English sites. Just send me a link. One calculation was resetting itself every night. This has been fixed. The leaflet is now classified as a note. 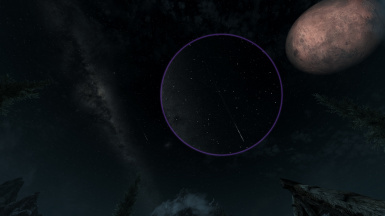 Stars will now fall in one general direction. This direction changes on a monthly basis and applies to showers/storms as well. Fixed possible desynching between values chosen and values shown in the MCM. 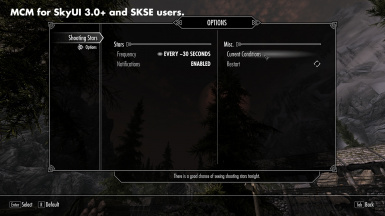 MCM now requires SKSE 1.6.6+. Added extra precautions to ensure all markers in the sky are properly cleaned up by morning. Added support for SkyUI 3.0 release. Added SkyUI config menu. Leaflet menu will be disabled if SkyUI 3.0+ and SKSE 1.6.5+ are installed. 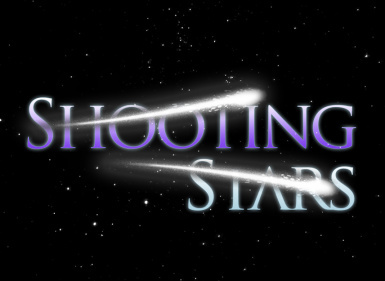 Shooting star intervals are now a lot more random. Removed quest flag from leaflet. If you lose it, you can craft another at a tanning rack with 1 roll of paper. Added 120 and 15 second frequencies. Added option to toggle notifications. 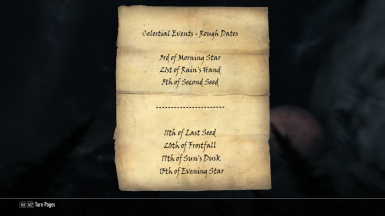 Meteor showers will now only occur on the dates listed. This mod is no longer supported. See here for the updated compilation.